Should You Buy a Combo Kit of Portable Power Tools? A typical portable power tool combo kit. 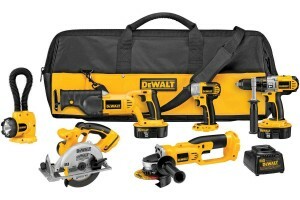 Combo kits of power tools are very popular in hardware stores. The kits offer at least two different power tools which use the same battery. Kit prices vary from roughly $100 to north of $1,000 . This post is designed to help you determine if a kit of portable power tools is the best option for you. Read the follow questions, ponder on them, and let them lead you to the correct decision for your situation. Do You Already Have a Portable Power Tool You Like? If so, you may be better off buying other individual tools to match the battery you already have. Most tool companies sell individual power tools without batteries attached. Buying tools individually lets you build the exact tool collection you need. If you have a portable power tool you don’t like it may be a good choice to get a kit of portable power tools. Do You Need Every Tool in the Kit? If not, you should do the math and see what it would cost to buy the tools you need individually. You can buy just one battery and multiple tools without batteries attached. Another option is to look for different kits by the manufacturer you like. Most tool manufacturers offer multiple kit configurations. Do You Trust Every Tool in the Kit? Not every tool manufacturer makes every tool to the same standard. Make sure you review each tool individually and make sure it has the power and durability you need. Don’t get roped into multiple bad tools because you were enamored with one tool. Posted by Scotty Burrell. This entry was posted in Combo Kits. Bookmark the permalink.